Impromptu chamber group: daughter Tanya on flute, Michelle on French horn, friend Allison Fletcher on bassoon. 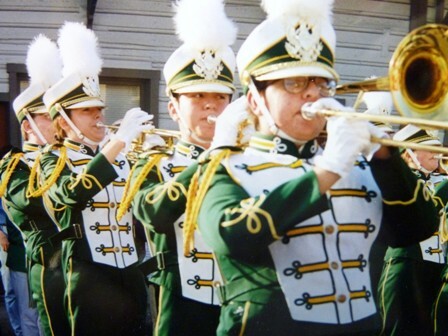 I planned to write a simple old marching band nostalgia post, for all the years and memories of my girls’ time spent in high school and college playing trumpet, flute and percussion instruments. Band threaded their teenage and early twenties with music, laughter, friends, camaraderie, the heights of happiness, and a place to belong. Playing Gate City in southwest Virginia on a cold and miserable December Saturday. 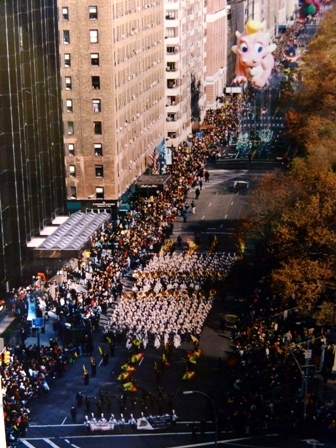 The Macy’s Day Parade in 2001, just two months after September 11. 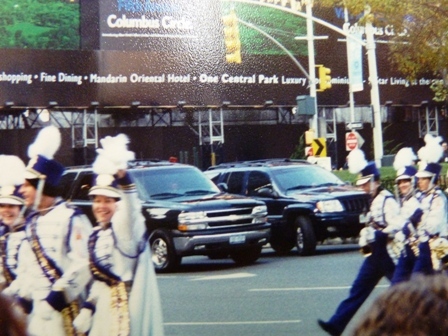 The crowd helped us yell “Tanya” (blue uniforms, marching, 2nd from right) until she heard us and looked our way! And finally, gloriously, winning an actual college football national championship (Division I-AA schools). As band parents, our girls gave us the gift of music, laughter, friends, camaraderie, the heights of happiness, and a place to belong, especially on Fall Friday nights and sunny Saturday afternoons. 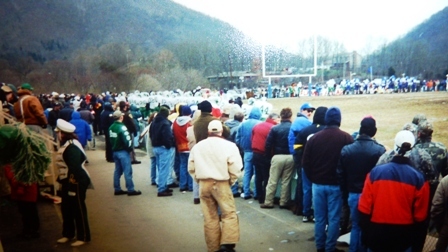 We were there for most of it, including the national championship game, and our first Macy’s Thanksgiving Parade. Band was something neither my husband nor I had experienced at any level. I had wanted basketball players. Growing up Hoosier in a basketball playing household, what else would you expect or want? I don’t think my husband was ever actually interested in band but it was also somewhat out of the realm of possibility for his family because of finances and with a mother who, because of illness, was not able to get out and do like band mothers have to do (and who died when he was just 19). 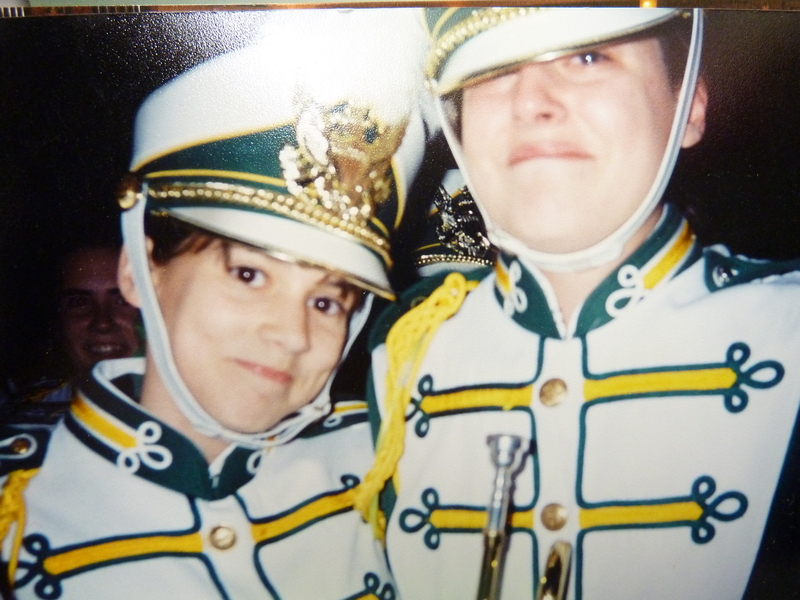 But when our oldest daughter got to 6th grade, band helped her survive the tumultuous torment of middle school meanies. 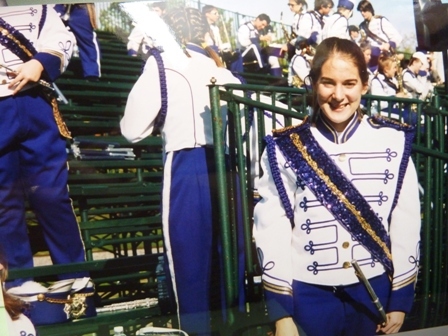 By high school she’d found her niche with the band crowd, crossing over also into choir. All three of them spent marvelous years helping in various aspects of accompanying or performing in exquisitely perfected school musicals at a high school aptly named Broadway High. 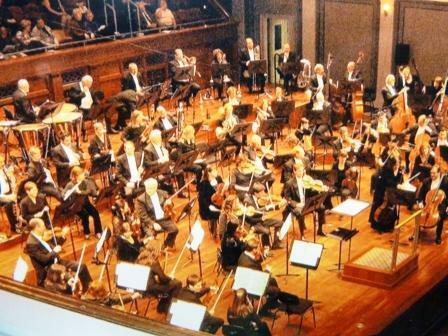 Nashville Symphony where daughter worked. 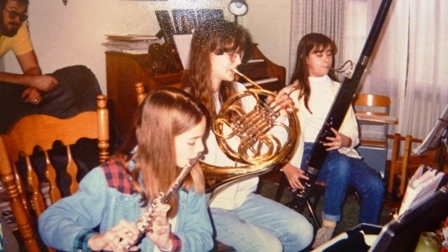 Middle sister ended up making orchestra administration her career; the two others didn’t find their careers in music, but made lifelong friends. All precious gifts to each of them. We owe the band world, and the teachers who were willing to lead them (and survive all the dang fund raisers), much! 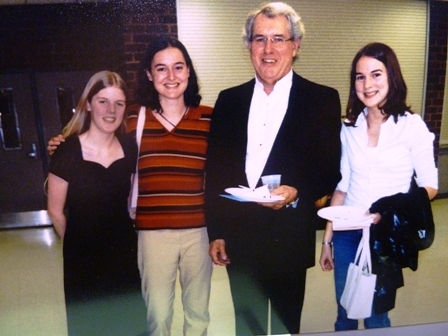 Our daughters with Mr. David Snively, longtime band teacher at Broadway High School at his retirement celebration. 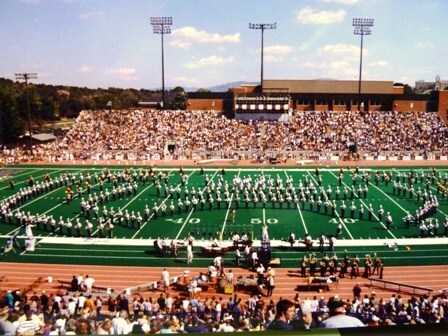 Hearing the band’s music swell up through the stands and experiencing the crowd pandemonium is always emotional for me anyway—remembering when Tanya was out on the field, with her father and I sweeping the field with binoculars to catch a glimpse of her among the 400 or so other marching band members. And then the announcer called for a minute of silence—amazing how quiet a large stadium can actually get—for JMU alum Alison Parker, gunned down with her cameraman colleague Adam Ward in the midst of just doing her job as a TV reporter 10 days earlier (two hours down the road near Roanoke, Va.): two deaths that would go down as the first on-air murder (so terrifying and heart-achingly sad) and no parents, no friends, no family members or colleagues want that notoriety—the awful notoriety apparently sought by the gunman. A short video commemorating Alison’s life on campus (graduated in 2012) and promising future was shown on the huge electronic billboard. Alison’s parents were in attendance at the game but mercifully not spotlighted. And my tears flowed some more—until a woman, a stranger sitting next to me, put her hand on my arm and asked me if I was okay. I assured her I was, mumbling something about the band music always made me emotional anyway. But no, none of us are really okay with this kind of violence tearing through our hearts and lives. Or safe anywhere, I thought, not even that much comforted or assured by the armed police and security guys standing around the field. If marching band sometimes gave us moments of exuberant happiness, this was the opposite: utter grief, dismay, sadness. I thought back to more moments of silence—too many times—at other football stadiums filled with people. When a daughter’s best friend’s mother died after surgery for a kidney transplant and the band dedicated its music and half time show to that band mom, Liz. When thousands of us in football stadiums across the U.S. dedicated their games and half time shows to those who died on September 11, 2001 in New York City, Washington, D.C. and the random field near Shanksville, Pa. where Flight 93 ended. When my youngest daughter’s high school classmate, a former state wrestling champion, Bucky Anderson, was killed in action in Afghanistan 2010 and a ceremony with moments of silence were held in his honor at a Broadway football game. Music—whether it is the stuff of marching bands, symphony orchestras, powerful soloists, or a church anthem on Sunday morning—has the power to move us in the inner places of our hearts and psyches to feel things that need to be felt. I felt fresh pain for the parents and loved ones of Alison, and all families who’ve had to grieve the too soon deaths of their offspring: something every parent fears and knows can happen yet hopes against hope that the senseless, random, and especially media-inspired killings, at least, can somehow be curbed, deaths lowered, even, eliminated! Dare we think it, dream it, pray for it? I hope so, or we are miserable human beings not to dream of, envision, and work for a better world. We may not agree on how to work at eliminating senseless violence in all its forms—whether war, accidental, domestic, or murder, but we must continue to believe in and march toward a more sane and safer world for all. God of all comfort, we confess our bewilderment, our sadness, anger, and fear. Surround those who mourn the loss of loved ones. Embrace them with your loving arms. Comfort those whose loved ones are missing. Protect those who risk their lives protecting others. Strengthen them with your loving arms. Remind us that your love is stronger than hate. Keep us from becoming the evil we deplore. Give us wisdom and restraint. With trembling faith we pray, O God, for a sure sense of your presence in our grieving. Embrace us with your loving arms. In you alone do we trust. Amen. Younger sister Tanya comforting older sister Michelle at a final home game. Grace!! I saw you at the Food Lion grocery in Broadway recently with your lovely daughters. How grown up they are getting. Glad you enjoyed this brief flashback and YOU were a great part of why band grew on our family. Strike up the Broadway cadence!! You have an accomplished family, Melodie – both literary and musical. I once read that music bypasses the analyatical/logical parts of the brain and goes directly to the heart. And so it does. The tribute at the end caught me off guard. Now I have a catch in my throat. Very poignant post, especially as we approach 9/11 tomorrow. I hope the change in mood didn’t jerk you or other readers around too much; in that way I guess it was like the minute of mourning at the beginning of a football game–or how such tragedies (including 9/11) blindside us all too frequently. Amy and Jonathan were both in the band. 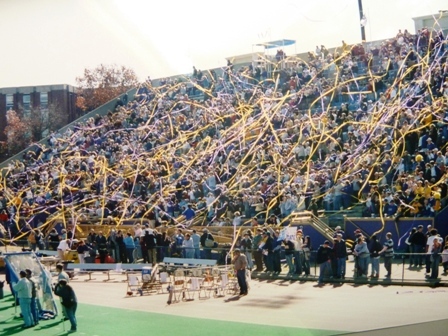 We went to every home game and lots of competitions. I remember some VERY late nights, sitting in the car at the school waiting for the buses to pull in. Oh my goodness, I forgot to mention those nights waiting in the school parking lot. Not so fun. Did you go on any band trips? I never became a band parent, but I had friends who were. 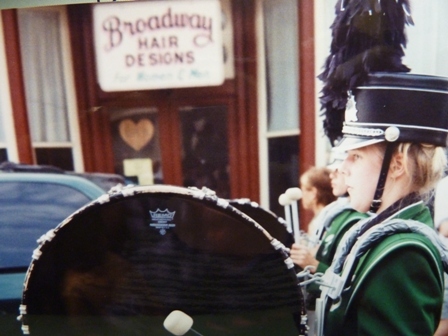 Joel Kauffmann at one time thought about writing a feature film screen play about Indiana and the band competitons, the band instrument manufacturing, and the fervent fan devotion combining sports with band. It is a great subject. Not sure he ever wrote the script, but it could make a great movie. As you point out above, Melodie, silence is an important part of music. And music can be an instrument of peace, as it was in the hands of David the harpist. Anyone named Melodie has a head start on becoming a musician! Thanks for your comments–especially pointing out silence as part of a musical performance. I always appreciated Ken Nafziger’s philosophy, too, regarding instruments accompanying congregational singing–instruments having a place as an additional voice–but not an overwhelming or predominate voice. Thanks for the extra pondering your ideas brought!